AMSTERDAM -- Self-driving cars may not be on the road anytime soon, but that isn't stopping Dutch navigation device maker TomTom from investing in high-definition maps needed when autonomous driving becomes the norm. Later this year, the first trucks will hit the road with software and maps from TomTom that will automatically adjust speed when a curve or climb comes up. The products, aimed at cutting fuel use for now, are part of the ever-expanding technology needed for driverless vehicles -- if and when they become ubiquitous. TomTom CEO Harold Goddijn is not losing any sleep over when that might be. "For us, that's not a problem, because we're already moving to increasingly higher levels of automation," Goddijn said. "You could say that we're already there with semi-autonomous driving, and the reality is that we'll transition through stages towards a fully autonomous future." Goddijn, who has been leading the company since 2001, may not have much choice. TomTom, which has years of experience creating static maps -- the kind embedded in traditional car navigation screens -- is contending with the terminal decline of what used to be its core business -- personal navigation devices. Also, it's vying with companies such as Here and Alphabet's Google in the race to dominate the "dynamic," or HD maps, market. 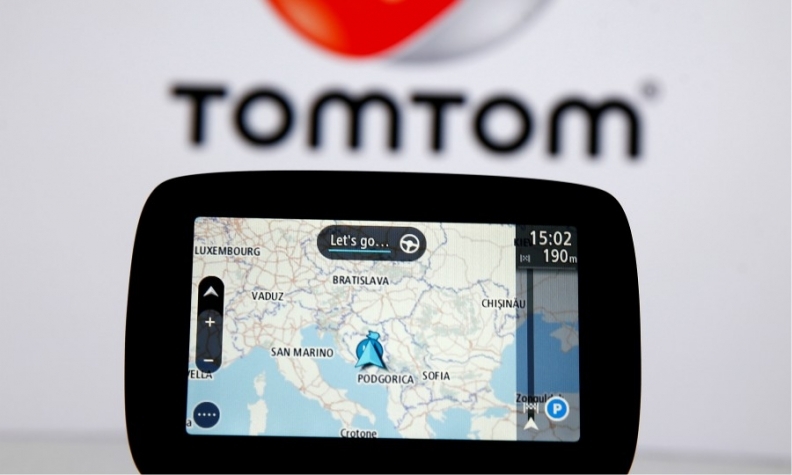 As consumers pick varied options to find their way on the road, 2018 sales at TomTom are set to halve to about 800 million euros ($981 million) from 1.7 billion euros in 2007 when the major share of the company's money came from selling sat-nav devices. The perceived reliance on personal navigation devices in TomTom's sales mix is a concern for investors, said Joost Eijsink, a trader at Market Wizards. The company's consumer segment, which makes the devices, accounts for more than 40 percent of annual revenue. "I do understand the problem that poses," Goddijn noted in the interview, adding the decision was made not to divest the consumer business as TomTom is the best owner of the business, and it's also profitable. "The profits we're generating there also gives us the opportunity to invest, for example, in growth activities." Goddijn's challenge is to convince shareholders that the company's business model has changed and that profit margins are widening even as the top-line continues to weaken. That's because the firm's two other segments -- Telematics and Automotive & Enterprise -- which operate more on a B2B model, generate higher margins. The company's gross margin -- the percentage of sales less the cost of goods sold -- is expected to be close to 70 percent this year, up from 62 percent in 2017. Earlier this year, TomTom extended a July 2017 partnership with Baidu, in which it supplies the Chinese search giant's Apollo driverless project with its HD mapping data. The Google of China wants to release a driverless car by 2018 with mass production to begin by 2021, and the extended collaboration was seen as a "big vote of confidence" for the Dutch firm. On the path to self-driving cars, Goddijn said that making and maintaining the HD maps, which autonomous cars need together with powerful sensors to see and advanced software to think, will be just the first important step, followed by regulation, certification and -- last but not least -- user acceptance all on the road ahead. The company plans to invest "hundreds of millions of euros per year" in its automotive businesses, which include the development of HD maps, according to Willem Strijbosch, the company's Head of Autonomous Driving. Goddijn's commitment to the firm's three-pillared structure comes at a time when TomTom is facing investor scrutiny after Reuters reported last month that it had enlisted Deutsche Bank to help with a possible sale of the whole company or a minority stake. TomTom said it denies "it has engaged a financial adviser to look for potential buyers." Goddijn stood by that statement. For now, even the much-derided devices business gets some praise from the CEO. With three to four million new personal navigation devices sold each year, they are a "trusted product for millions of people," Goddijn said. "There's no need to make a drama out of that," he said, adding that it just needs to run "its natural course."